Pop's made a few changes to this recipe to make it even better! First, to the cream cheese mixer, add a little Colby Jack cheese. Also he rubbed the outside of chicken with olive oil to add a bit of moisture to it before you wrap with bacon. Cut open jalapeños and carefully de-seed. You want to keep the shape. Make sure that chicken breasts are thin and easy to roll. About ¼ inch fillets. Fill jalapeños with cream cheese and ranch dressing (here is where to mix in small amount of cheese as well). 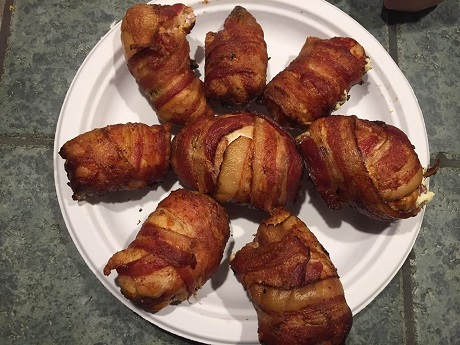 Wrap chicken around the jalapeños, (rub outside of chicken with olive oil) and wrap bacon around the chicken. Seal with a toothpick. Place on a lined and greased baking dish. Continue until all jalapeño popper chicken wraps are made. Bake for 40 minutes or until bacon is crispy and chicken is cooked through. Pop's did these on his green egg grill with indirect heat and it really cooked well.